Taking it's routes from shabby chic and homely country cottages, rustic country is more homely style with more colour (still muted pastels) and hearts than modern rustic. 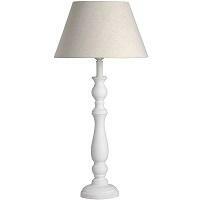 Furniture has a vintage french country feel with rounder more ornate shapes and inspiration from the victorian era. 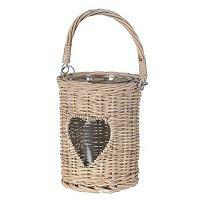 Wicker is greatly featured as are painted home accessories and is a lot more twee. Slogans and phrases adorn a house with this look, which will be uplifting and based around love. Designed to sit in a country cottage or period property the look can be adapted and would add charachter to a new build. We love a slightly minimalist style but you need a bit of extra accessorising to create this look. The french cottage rustic home decor is made up of a mix of raw wood with painted surfaces and has a more refined feel than our pure rustic look. This look is very warm and cosy and works well in older properties. This look can also be created in a modern home by painting the walls in a natural stone or grey colour to provide the backdrop for french shabby chic furniture and accessories such as painted raw wood, heart shaped decor, flower jugs which are perfect to place you favourite everlasting faux flowers. The colour palette of the rustic country home decor collection consists of tones from an old stone french farmhouse with soft linens, taupes and creams, shades of grey, greens and blues, emulating slate floors. 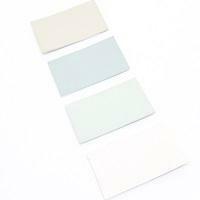 It is always advisable to choose 3 colours for your scheme for example stone, neutral grey and moss green. These colours all blend well together and can be interchanged on furniture or walls, try to contrast for extra impact. To stay true to this country feel you need to ensure that your flooring is tonal and try adding colour by dressing your room with country home accessories like faux flower hangings in soft pastel colours. Avoid using bright white colours as this is too harsh for this style. 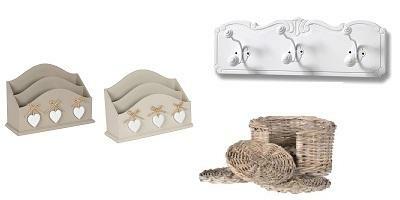 Rustic home accessories include a lot of creams, greys and raw or painted washed woods to give an extra depth. These muted colours need to be balanced with shabby chic home decor try adding pastel tones such as blue, green, pink or purple to enhance the farmhouse ambience. We also suggest dressing your room with faux flowers, wicker heart decor, painted photo frames and more colourful candle holders or lanterns. Rustic wood looks great but don't over do it as it will start to look drab, take a look at our uplifting rustic wood long signs to add some postive thoughts in your home. Try to contrast these accessories with a lighter coloured wall. Our vintage homeware accessories are inspired by country cottages with a vintage french cottage feel from the victorian era and combining elements such as wicker, painted home accessories and slogans. It is important to keep your french style furniture look as simple as possible and if you can contrast the colour with your walls as this will ensure it stands out and looks effective. French period furniture consists of two tone colours and embellished with french floral moulds as well as furniture with pull out wicker baskets instead of drawers. If you've kept your walls light it's best to style it with dark furniture, you can always use chalk paints to change the colour of your furniture if you feel like experimenting with colours. We recommend Zinc, Moouse or Hurricane in our vintage paint range to create this look. 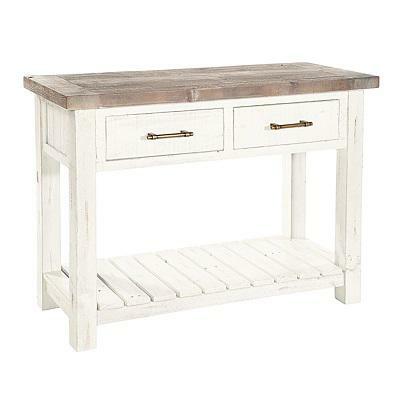 We love furniture with wooden tops, seagrass drawers and cup handles, like our Boston range or our rustic country painted range where you can find furniture with a distressed finish and painted wooden tops. Both these ranges are perfect for creating this rustic country style.